Hence, we ended up at the popular eatery 상국이네 김밥 Sanggukinae Gimbap 相國家飯捲 recommended in the guidebook. Indeed, queues were forming before lunch time, and we had to go to the second storey to find seats. There was a huge menu on the walls, and we spent some time doing Google translate to figure out the Korean words. 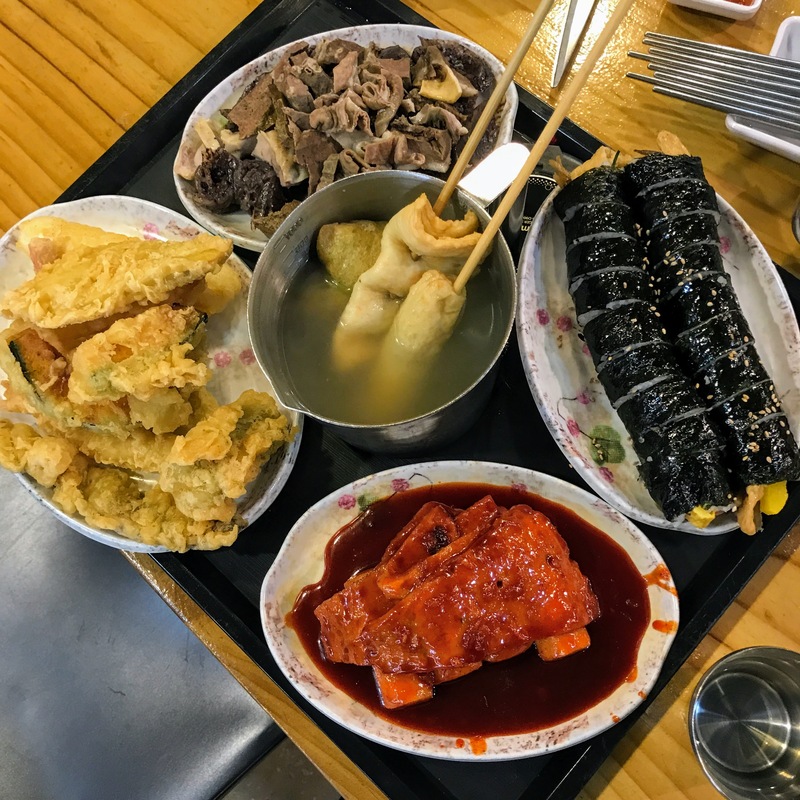 Eventually, we decided on a Set B (₩19,000, or 19.0 as indicated on the menu),which worked out to be slightly cheaper as compared to ala-carte orders, and this would give us a chance to try out more variety. 순대 (Sundae / Soondae ) Korean Black Pudding / Blood Sausage 血腸: This version was a bit harder and more plastic-ky/mochi-like than the ones we tried previously. I really could not bring myself to eat much of this 😦 The dish came with other innards, which I thought was not bad. 떡볶이 (Tteokbokki) Spicy Rice Cake 辣炒年糕: Ah, I’m still not a fan 😛 This dish also came with a few pieces of fish cakes, which I preferred. 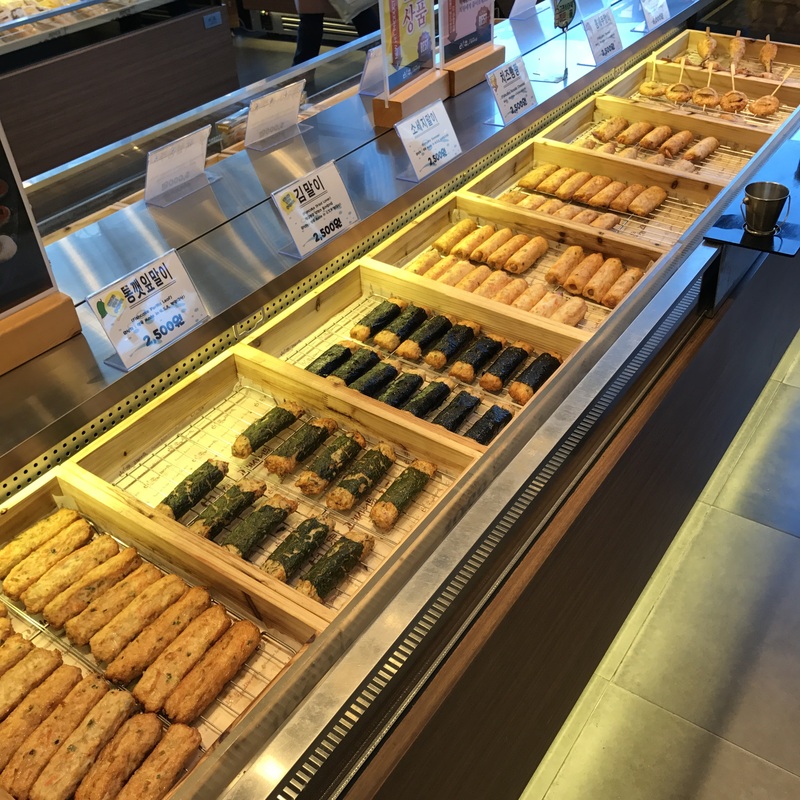 김밤 (Kimbap / Gimbap) Korean Seaweed Rice Roll 飯捲 (2 pieces): One of our favourite items, the rice rolls were glazed with sesame oil, making them look and smell really appetising! We ate this quickly before the seaweed got too soggy, and it was full of yummy ingredients. 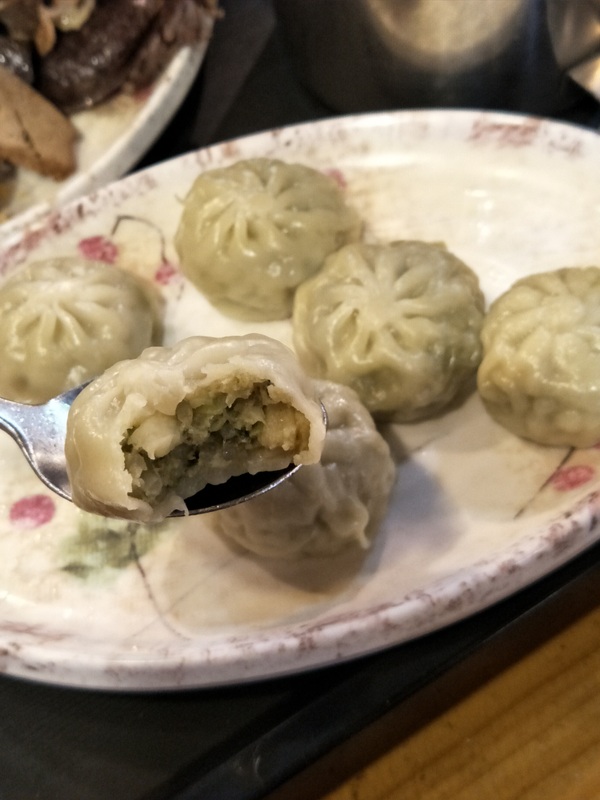 찐만두 (Mandu) Dumpling 蒸餃: Meaty and juicy, we thought this was delicious too! 튀김 (Twigim) Tempura 炸物 (10 pieces): We randomly picked the various items, and they were all not bad. 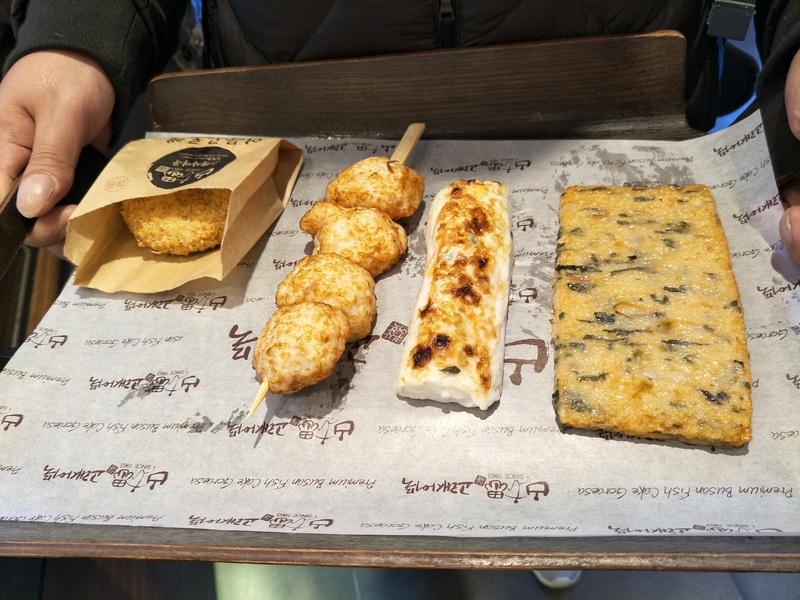 We also had a separate order of 오뎅 (Odeng) Fish Cake 黑輪 (3 pieces for ₩2,000), and it was certainly a good idea to have something hot on such a cold day. We also felt that the fish cakes had a good bite, and not very flour-ish. Overall, a very affordable and rather delicious meal! Went to the nearby Starbucks for some much needed caffeine and very strong Wi-Fi 😛 I tried the Jeju Houji Tea Latte (₩5,800), which I thought was not bad, while hubby thought that his Americano (₩4,200) was just alright. There were seats available upstairs, and we could heat up the fish cakes in the microwave before eating. There was a friendly staff who helped us heat up and cut our fish cakes. With our bellies filled, we took the subway to신세계백화점 (부산 센텀시티점) Shinsegae Centum City 新世界百货商店. First thing that caught our eye was the Namachoco Croissant 巧克力可頌 (₩3,500) by Royce’! Don’t think we ever saw this in Singapore, and it was worth every Korean Won 😀 It was very fragrant and despite being very chocolatey, it was not overwhelming or too sweet; simply awesome! We could not get enough of it! Next thing that we wanted to try was the 하나야끼 Hana Yaki はなやき (₩3,500 for the bacon egg flavour), which reminded us of a mix between okonomiyaki and Japanese red bean pancake. Then, we ran out of stomach space and time, because we wanted to be early for the 광안대교 (Gwangandaegyo) Gwangan bridge 广安大桥 lights up at 광안리 해수욕장 Gwangalli Beach 廣安里海水浴場. The sun was setting as we exited the subway station, and we managed to enjoy more cherry blossom views along the way to the beach 🙂 As we were quite early, we found a good spot to park ourselves, and watched others play with fireworks. By now, we were starving, and we decided to patronise a busy-looking BBQ restaurant which we walked past earlier, 육갑 Yukgap. 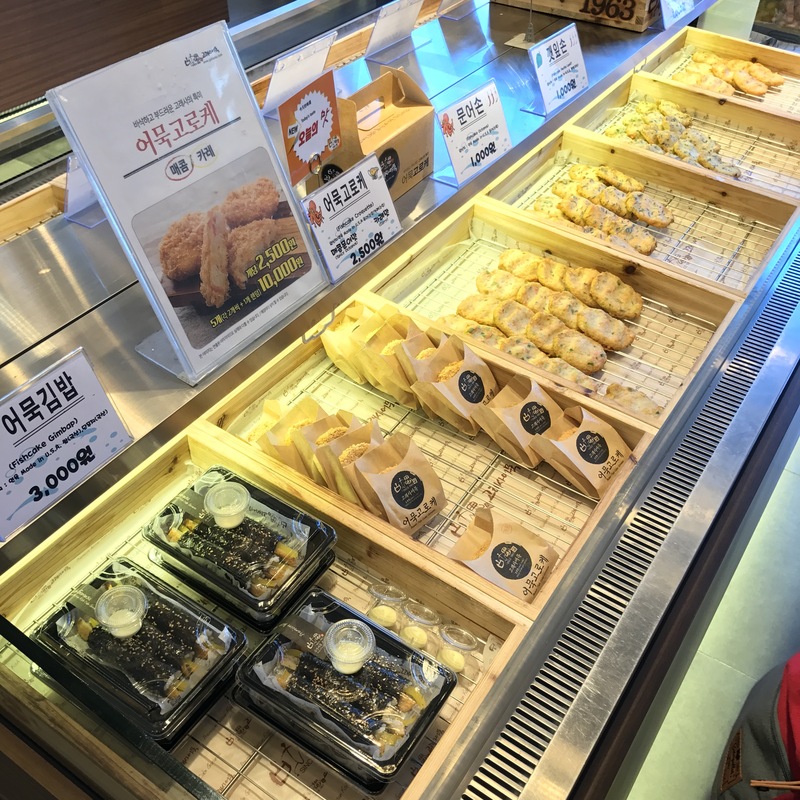 There was a staff who was able to speak some English, and recommended that we try the BBQ set (₩22,500), which came with 2 types of meat, soybean paste stew, steamed egg, and a bottle of soft drink. We also got ourselves a serving of mushrooms by pointing to the dish at our neighbouring table 😛 Side dishes and were available at the counter. The staff demonstrated on how to cook the meat and then left us to do it ourselves. It was pretty fun, but we wished we could read Korean to figure out what other types of meat were available. We were so stuffed after our late dinner, and we returned to our hotel happy and filled! 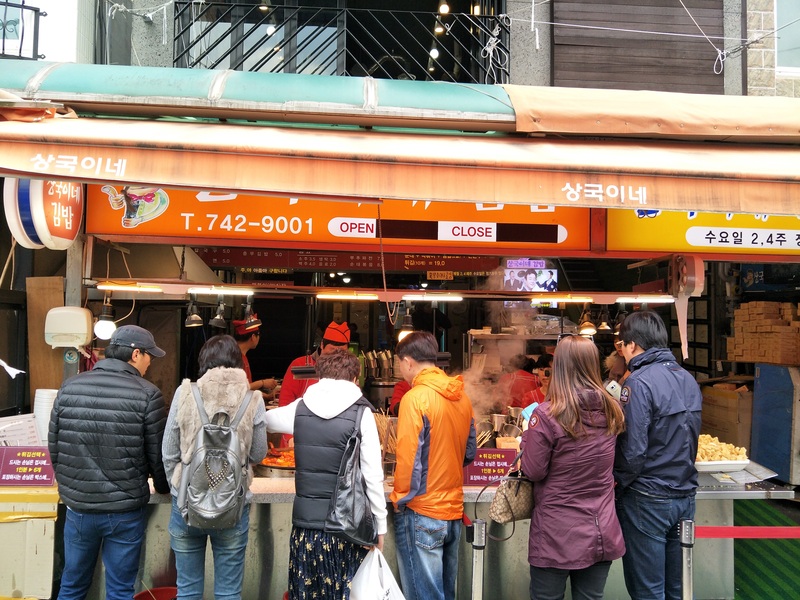 Directions: Walk straight out after Exit 3 of Haeundae Station 海雲台站 (Subway Line 2) along Gunam-ro (구남로‧龜南路) for 400m, then turn left when you see the entrance to traditional market. Walk a further 200m and it’s on your right. 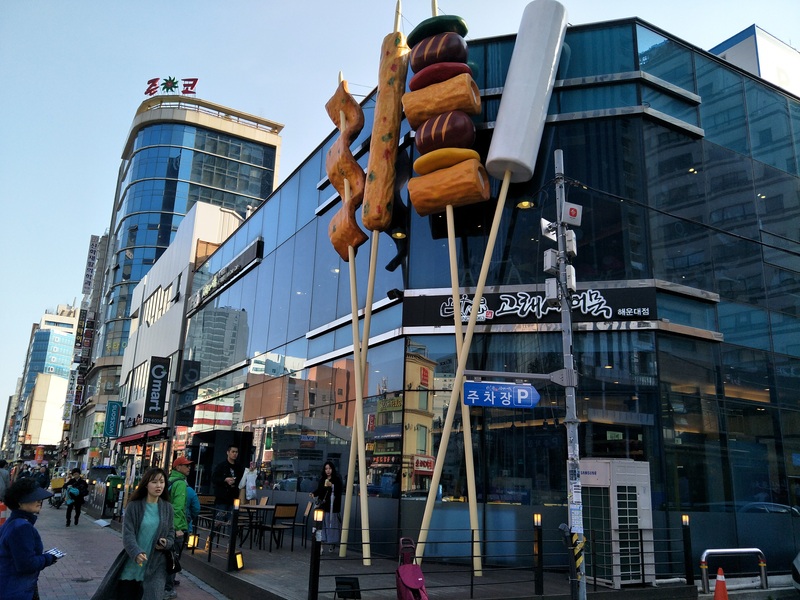 Directions: Walk straight out after Exit 5 of Haeundae Station 海雲台站 (Subway Line 2) along Gunam-ro (구남로‧龜南路) for 200m, and it’s on your right. Directions: Directly connected to Centum City Station (Subway Line 2). 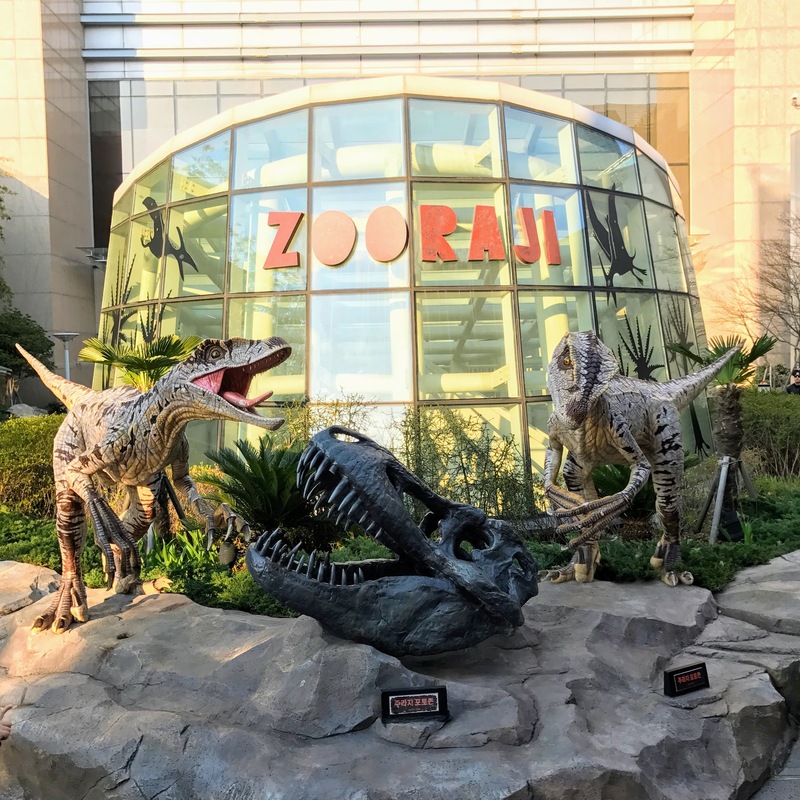 Directions: After coming out of Exit 5 of Gwangan Station (Subway Line 2, Station Number 209), there are directional signs pointing to the beach, which is about 10 to 15 minutes’ walk away.